Has your home been invaded by unsightly roaches, rats or pesky ants? Concerned that you might have bedbugs? Our experts are here to assist you with a full range of pest control, fumigation and extermination services for your home or business. Our exterminators are dedicated to protecting your indoor and outdoor environments from annoying bugs, critters and other pests. Our experts are prepared to care for your home and office extermination needs. Each of our exterminators is very skilled at what he does and is here to assist you with your pest control needs. If you are looking for a termite inspection or bed bug treatment for your home, our experts can help you out in a prompt and affordable manner. If you are looking for licensed extermination services, our specialists are available to help you out no matter where in the US you live. 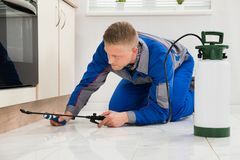 We offer comprehensive exterminator services that will not only get rid of the pests that you have in your home today, but will also prevent them from creeping their way back into your home in the future. When it comes to pest removal, you want to make sure that your office or living space remains a safe and poison free environment that is safe to live in. Our teams have safe treatments that work just as well as other, more invasive options while ending up with equally long-lasting results. Whether you are looking to deal with a minor bug issue or a full-blown roach infestation, we can provide you with the services that you need to make your space feel comfortable and pest free once again. To get the professional help that you need to keep your home protected, avail yourself of our great service today. Your home is a sanctuary for your family, kids, and pets, which is why the fear of termites or bedbugs can be very overwhelming at times You don’t want your living space to be overrun by pests, we get it, which is why we are proud to be able to offer you a full range of residential extermination services. If you hear pitter-pattering overhead in your attic, or you are tired of swatting flies right and left as you toss and turn in bed, we are here to assist you. With our home pest control services, you’ll be able to sleep better at night and you’ll reclaim ownership of your home once again. A commercial space needs to be as clean and bug-free as possible to insure that your employees are comfortable at all times. It is for this reason that many companies hire our pest exterminators to rid their work space of all bugs and critters. While running a business, the last thing you need to be dealing with is uncomfortable workers or clients. If you are looking for an extermination service to come to your school, hospital, restaurant, office, or store, our pest management team is ready to help you out 24 hours a day. Reclaim your space! Getting rid of pests in your home or office doesn’t need to be a burden. Call upon our exterminators today!